Burrs. Burdock. I used to be terrified of them, after once watching my parents spend hours picking them out of my sister’s hair. 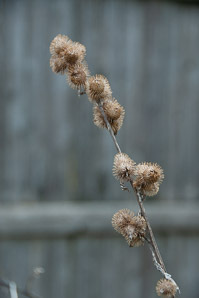 But the system these plants use to spread their seeds is inventive. 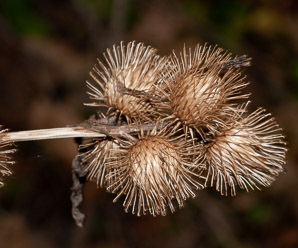 The seed pods, about ⅜" (1 cm) in diameter, are festooned with dozens of tiny hooks that latch onto passers-by. 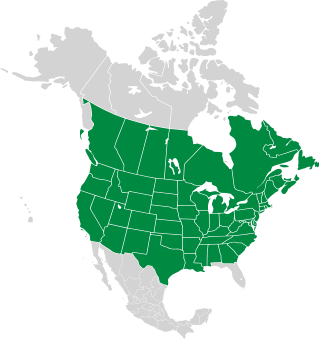 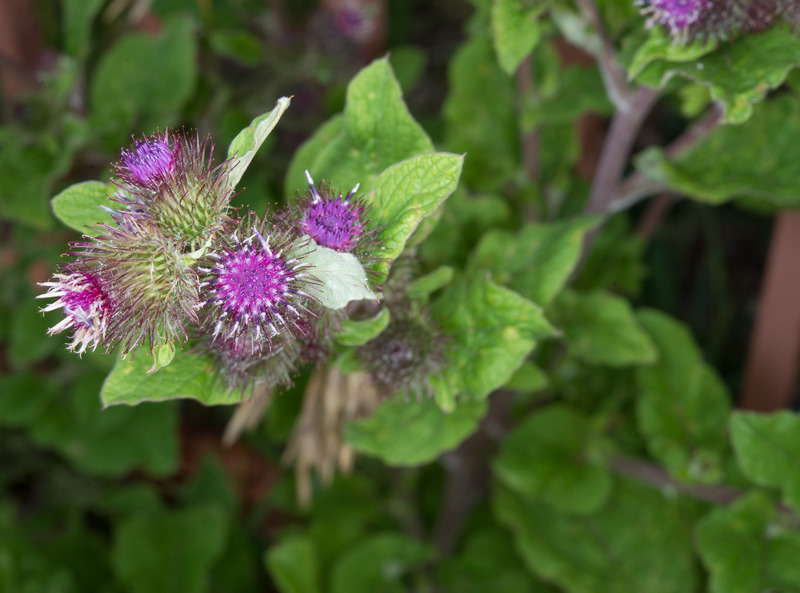 Burdock is native to temperate regions in Europe, the Middle East, and the Far East, but now naturalized and widespread in North America. The “Bur” in burdock is thought to be a contraction of the French bourre (from Latin burra), a lock of wool—perhaps the easiest place to find burrs. 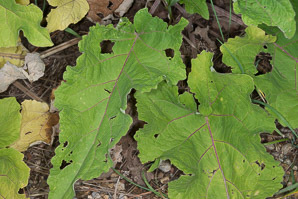 “Dock” describes the large basal leaves. 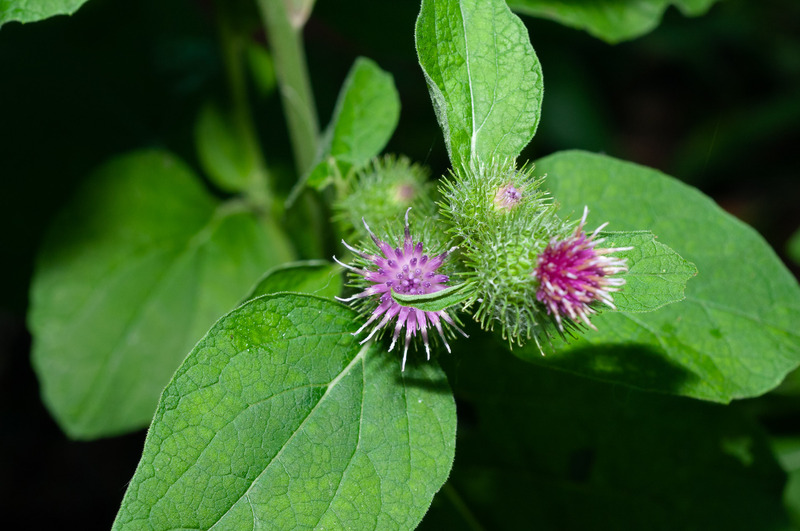 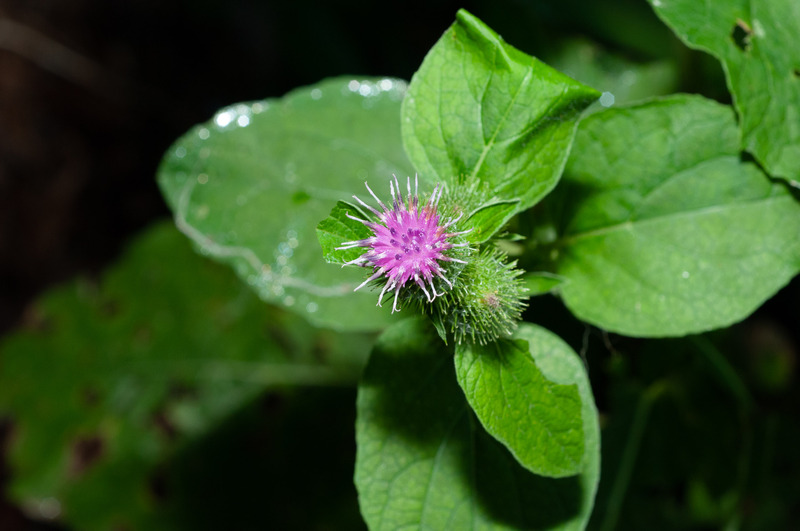 Identification: Burdock is related to thistles, and you can see this clearly in the purple (sometimes white) flower clusters, though the leaves are not prickly. 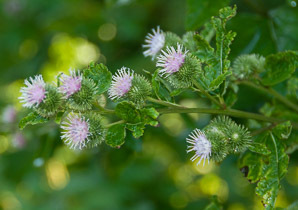 The plants reach 3-6' (91-182 cm) in height, and the flowers are beautiful at close range. The plant as a whole is somewhat ungainly though. 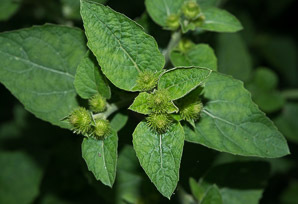 Most of the leaves, which are dark green and wooly underneath, are large, up to 24" (60 cm)], and low-lying—a basal rosette. To my mind they somewhat resemble rhubarb leaves. 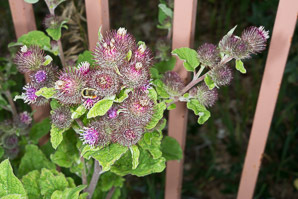 See also Arctium lappa, a larger version of this plant. 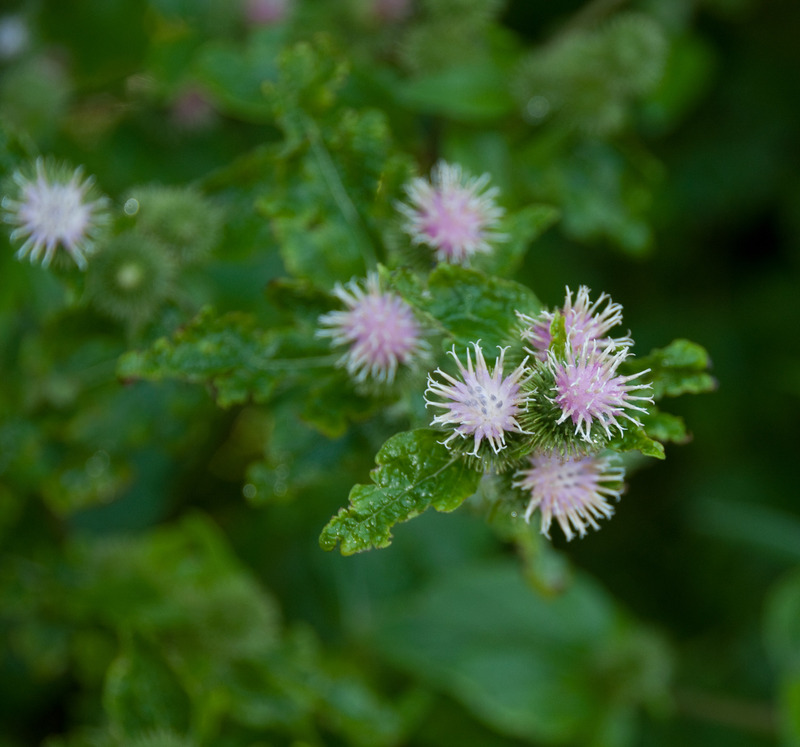 Edibility. Burdock roots are edible, benefitting from soaking and requiring cooking like other starches. 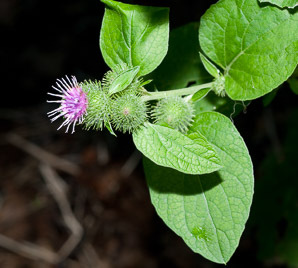 The flower stalks are also edible, while other parts of the plant are not. 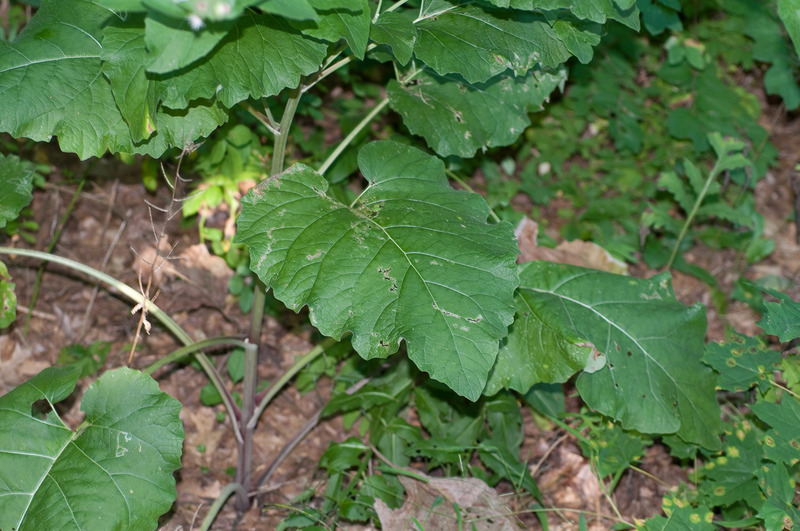 In Fiery Foods That I Love, by Paul Prudhomme, the Flank Steak with Black Mushrooms recipe includes burdock roots. Sautéed, the roots are used in the several dishes, including the Japanese appetizer kinpira gobō. 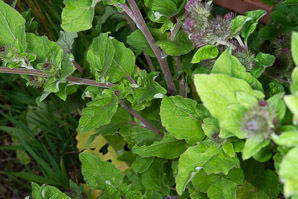 In some marts the roots are available from commercial growers. 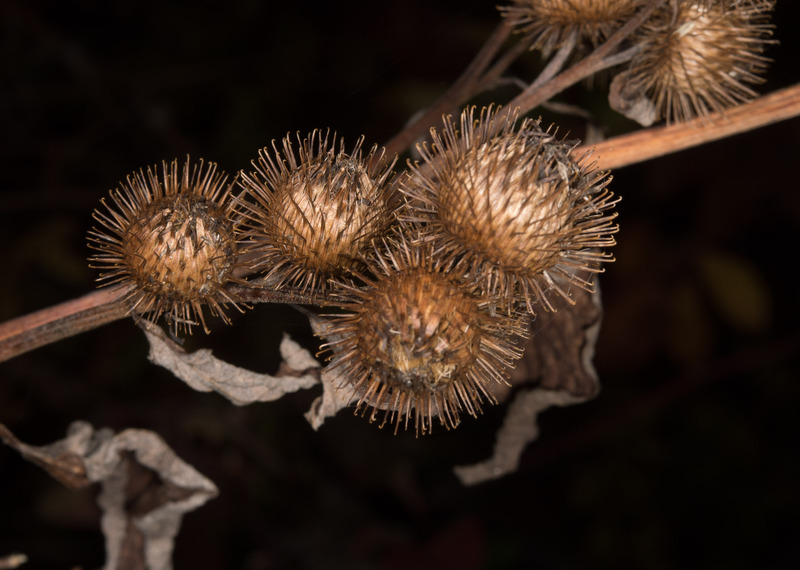 The roots of burdock appear very similar to those of common and highly poisonous deadly nightshade, so be careful about collection and make sure any commercial sources are trustworthy. In 1948 George de Mestrel, a Swiss inventor and hiker, found his dog covered with burrs during a walk, and, after examining the burrs under a microscope, invented Velcro. Arctium minus description by Thomas H. Kent, last updated 12 Oct 2018.